Soulja Boy was arrested for probation violations when someone tipped of the cops that he had guns in his home. The rapper has been flaunting guns on the internet and making threats to several people lately. Someone called up Crime Stoppers and the police swooped down on his Hollywood Hills home and slapped on the handcuffs. It looks like all of Soulja Boy’s gun-toting has finally caught up to him — he was just arrested after someone snitched on the rapper for threatening people online. Law enforcement sources tell TMZ they paid a visit to Soulja’s Hollywood Hills home Thursday on a Crime Stoppers tip that Soulja had been threatening people online with guns. Cops showed up, searched his house and we’re told they found a gun inside … so Soulja was arrested. You’ll recall … Soulja’s on probation right now for his loaded gun case from a couple years ago … and he’s not allowed to have any weapons on him. 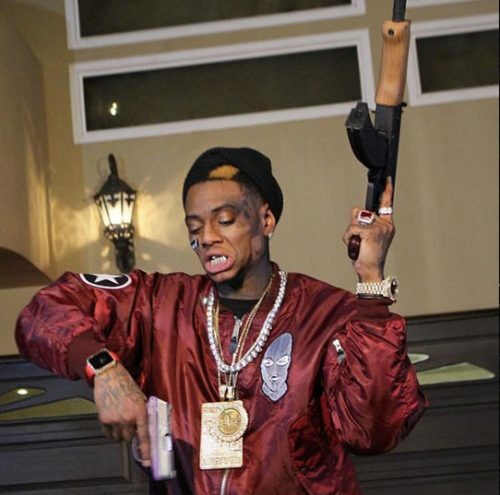 As we reported … Soulja’s made numerous threats to people on social media lately. He has since scrubbed the gun-totting photos from his social media pages and has been released on bail.